I remade the brown strip for the front of the shoes. It now attaches more securely. I also added a bit of Velcro to hold these parts in position. Bit Cloud has short normal looking hair. It spikes out a bit at the front. I bought some thinning scissors. Used them to cut the wig. 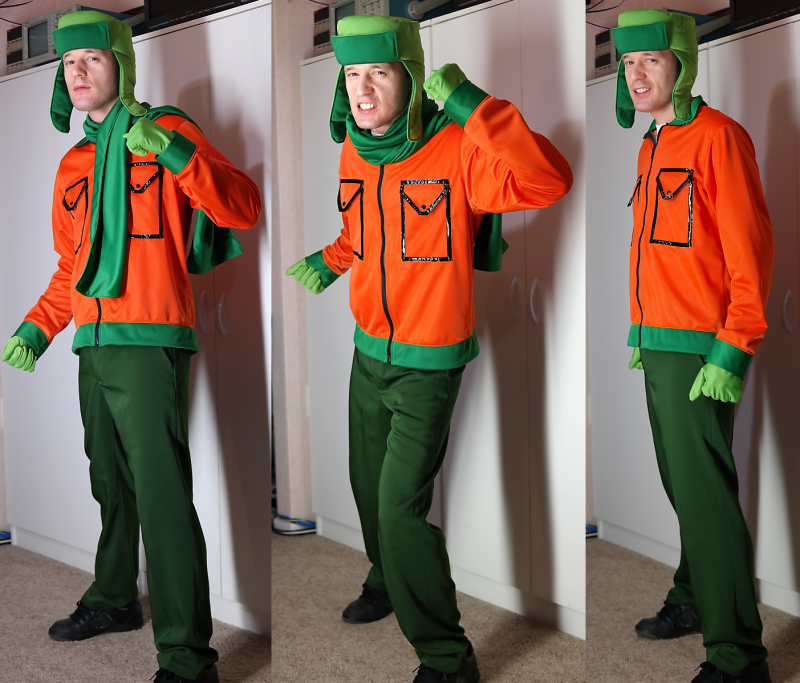 Took some quick test photos while checking everything fits. I can never get over how ridiculously neat your sewing is! 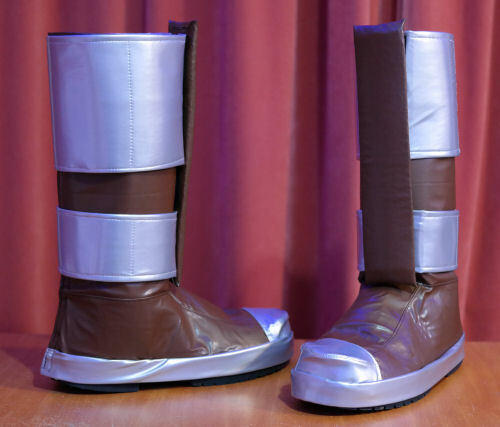 Your boots always come out looking really great! 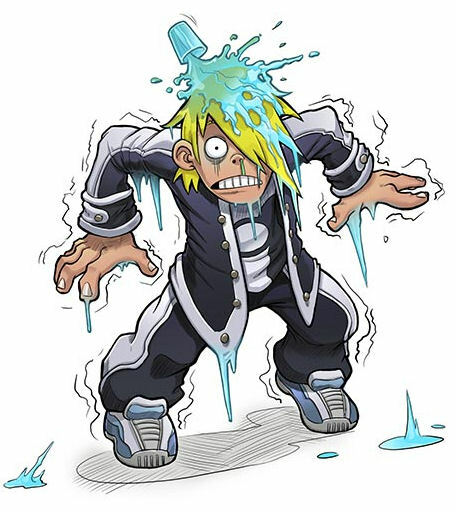 I think you did a great job on the wig, halfway between realistic and halfway between cartoonish! 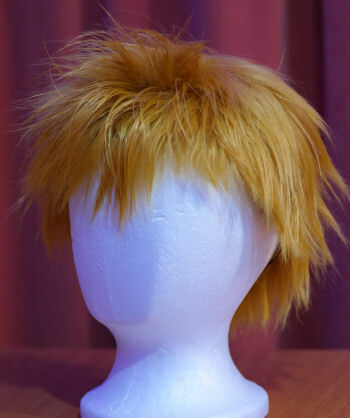 Cutting and styling wigs is often a hassle. It is nice this one worked out good without needing much work. I have already bought most of the materials. I expected I would have done a lot of the work by now but got side tracked on other things. Recently I have been thinking about ways to implement red light in the sword. 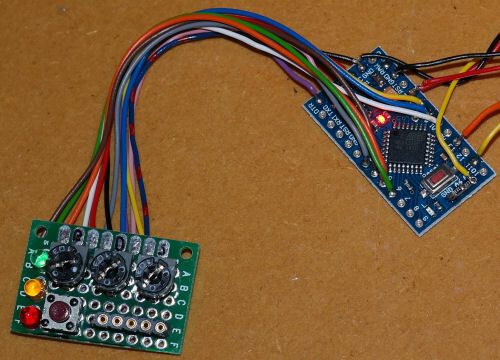 Most likely multiple PWM outputs of an Arduino microcontroller driving red LEDs. Analog inputs can facilitate control of pulsing speed and depth with variable resistors. There is the thing EL Wire, it's probably the most bendable? I have no experience with it. 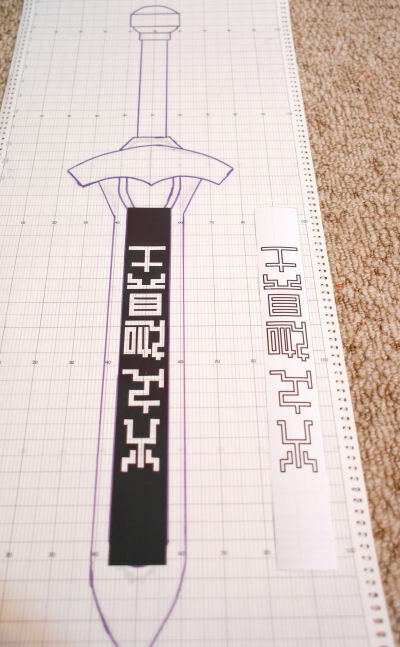 Otherwise you could do a stencil cut out for like the sword surface/case, and have the letters in clear plastic with cellophane or red semi-opaque plastic, and have lights underneath in the sword cavity that can light up?? I hope I made sense! But Electroluminescent stuff is not overly bright. I want to use multiple high brightness LEDs so it is still visible in bright light / outdoors. Controllable so it can be made dull for indoors (Avoid 'blowout' in photos). I plan to extract some of the plastic light defusing stuff from a computer LCD panel and use that behind a 'stencil', as you suggested. I would use multiple sets of LEDs along the edge of the defuser. 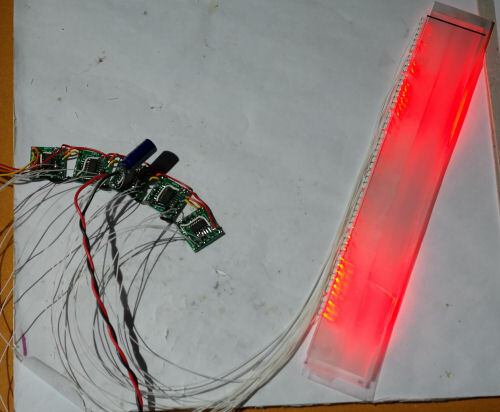 By sequentially varying the brightness (PWM control) of the individual LEDs wave / ripple effects and other fun things can be created. 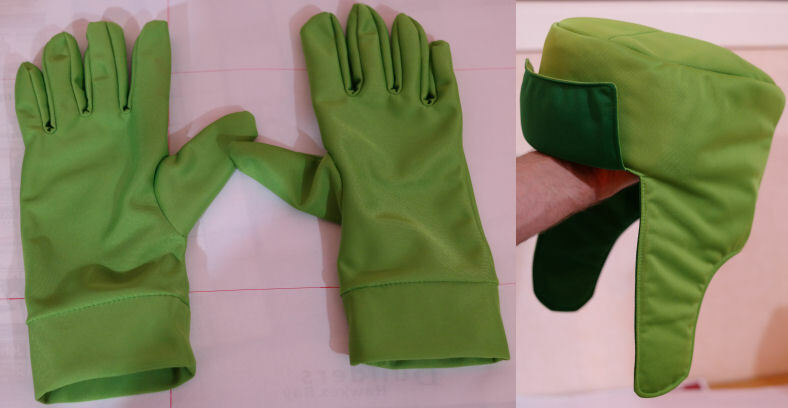 I read on the internet that it is possible to make to make gloves from a stretchy fabric like spandex and only need a front and back piece. That should make the process of making gloves simpler and quicker. I had a go but I can’t get the fingers wide enough to fit and not cut off circulation. Not sure what the problem is. I made the pattern with the fingers as wide as I could. I used flatlock stitch. I don’t have a 4 needle 6 thread industrial machine to the ‘proper’ flack lock stitch by my overlocker can do a basic version. 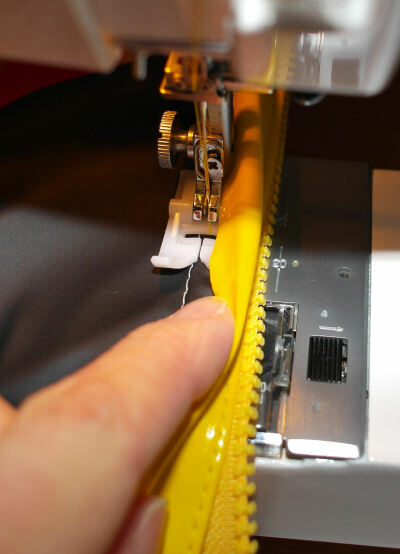 It is interesting because you sew it like you would a normal overlock but with wrong sides together. 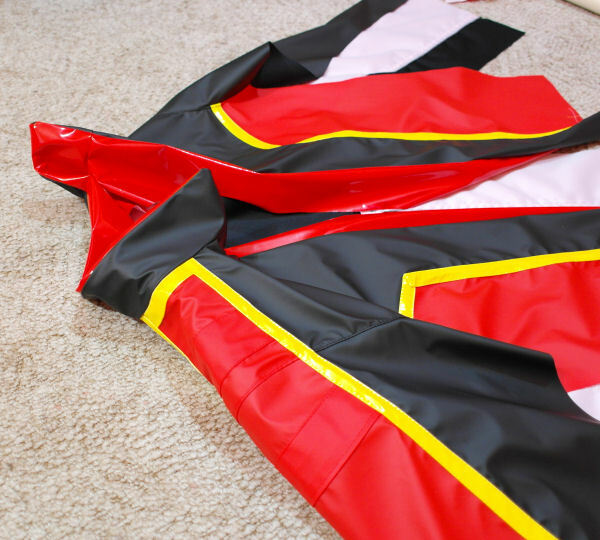 After sewing you pull the fabric apart and the fabric and stitch flatten out (most of the time). 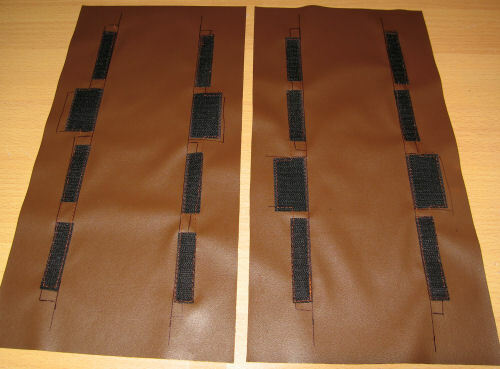 This gives you a flat join on both sides and preserves the stretch of the fabric in all directions. Sewing flatlock between the fingers is tricky and I thought that might be using up too much of the fabric making the fingers too tight. 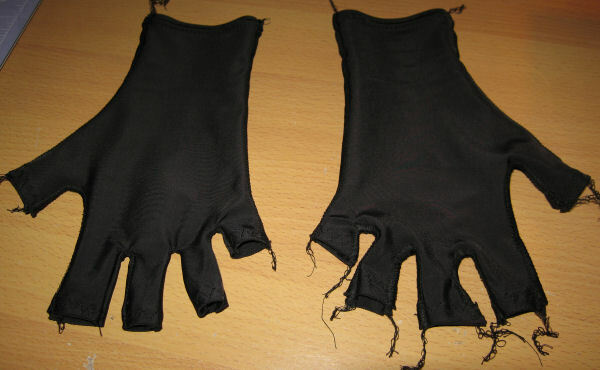 I tried sewing another glove with standard machine stitching between the fingers. Still too tight. Might end up trying again with a gusset between the fingers. I think stitching the ends of the fingers over has made them narrower. 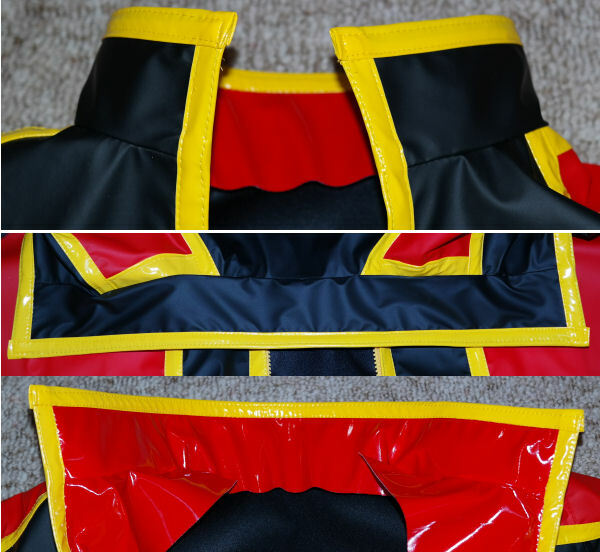 This might not be required because the fabric does not fray very much but I would prefer the cleaner appearance. Maybe my fabric does not stretch enough. I went to Anime Expo. 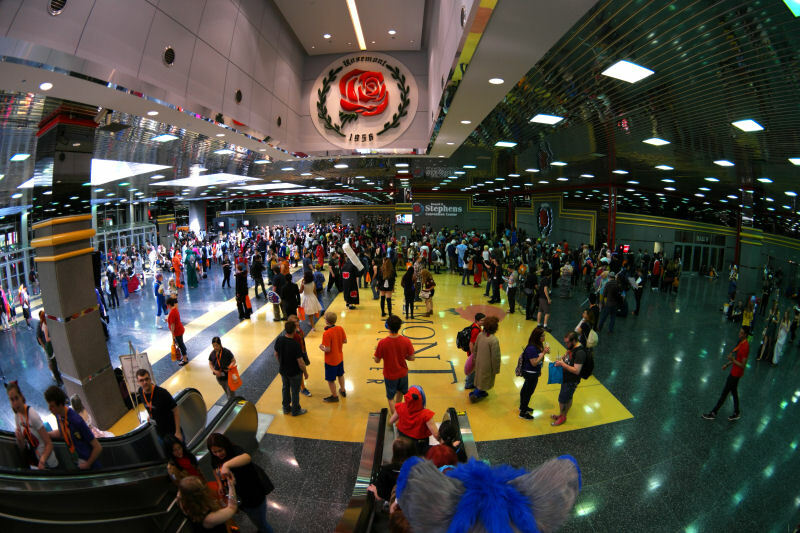 Anime Expo is the biggest Anime convention in the US (4 Days, 24 hours). 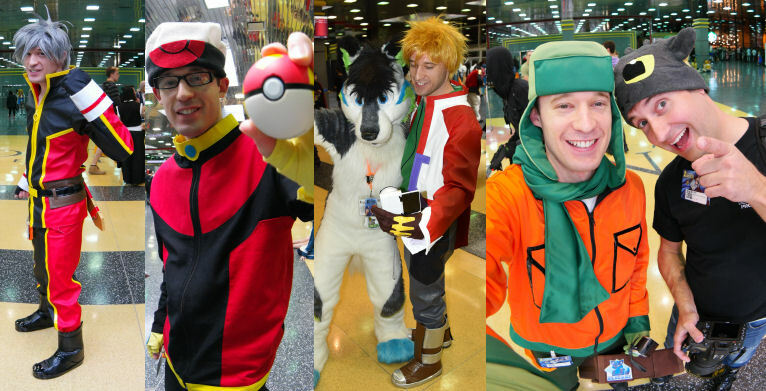 If you like big Anime Conventions (and warm weather), you should consider going there. 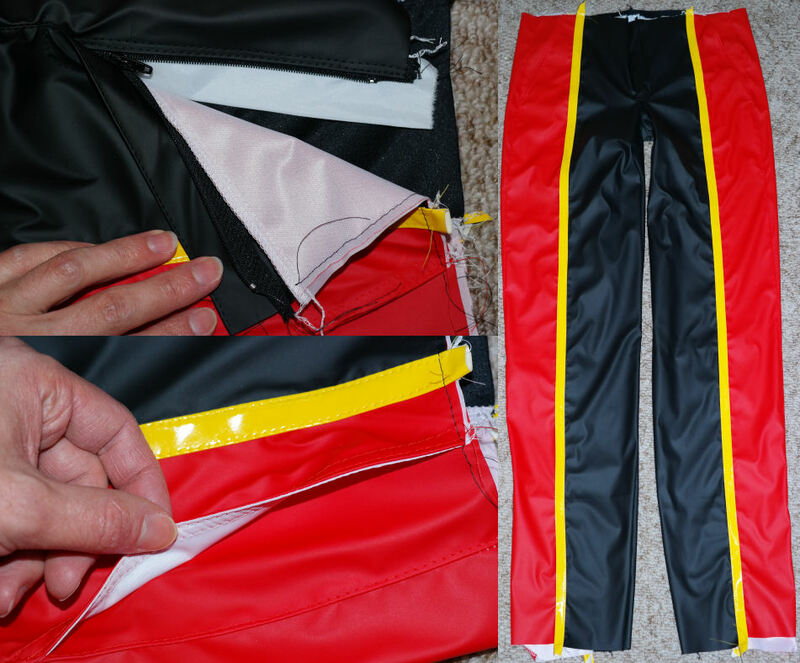 Working on trousers. Something not too difficult to begin with. Pieces joined together and yellow lines added. 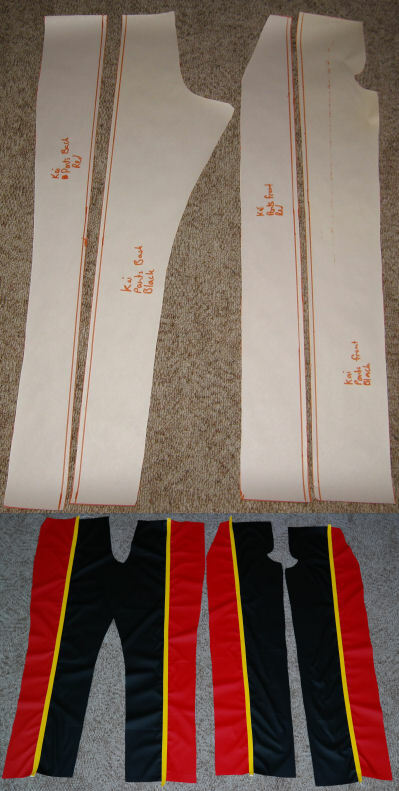 Next the waist band needs to be installed. Dayum man, I always admire your neat stitching! 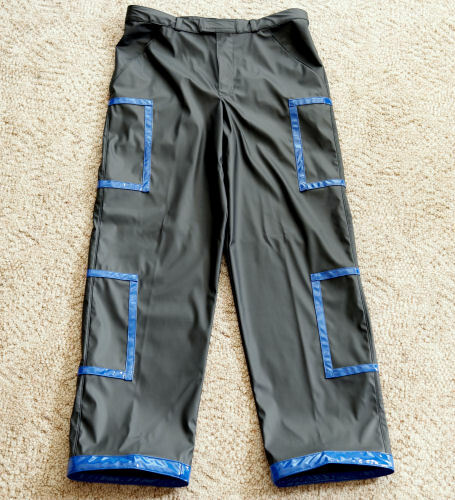 What fabric did you use for the pants? It looks like some sort of vinyl?? 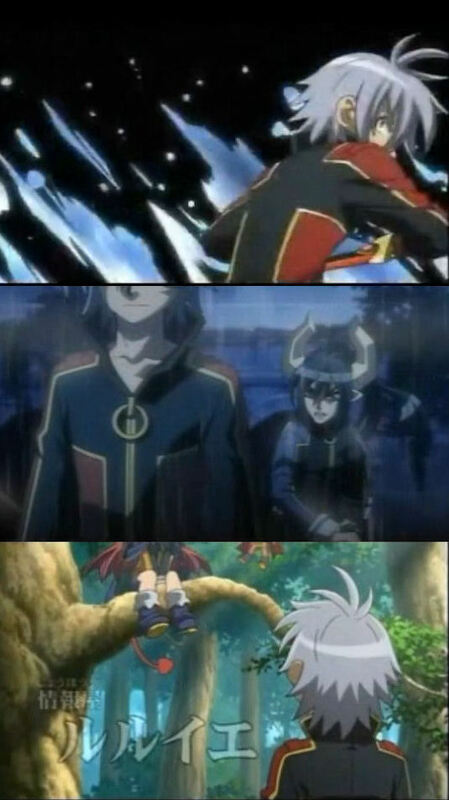 It gives a clean bright appearance like you see in Anime / Artwork. Trousers are finished. 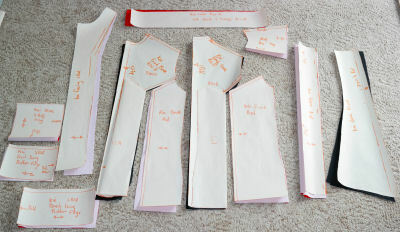 It mostly went ok apart from part of the waist band being attached at a slight angle which made things a bit difficult. 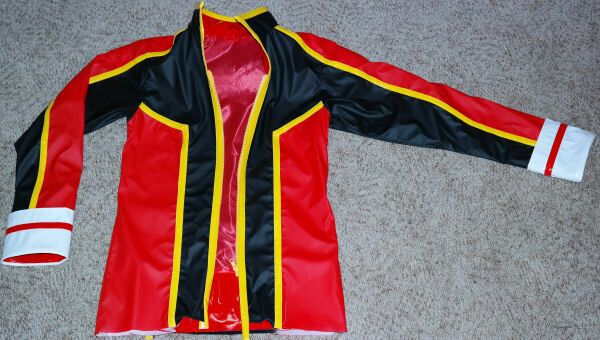 At least from the outside it looks ok or will be covered by a belt. 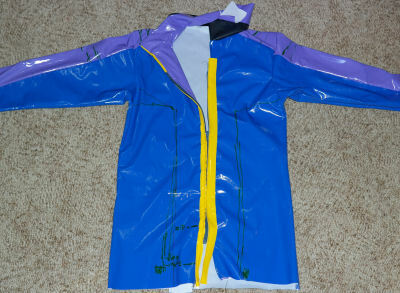 Now I have started working on the jacket. 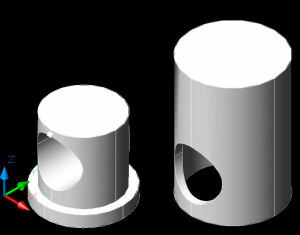 I have made two prototypes to check the shape and fit. Happy with that, I have started on the real thing. Prototypes used up the very bad quality blue fabric left over from Lucario and proved that the first two ideas I had for attaching the zip failed. I was trying to hide the edge part of the zip. 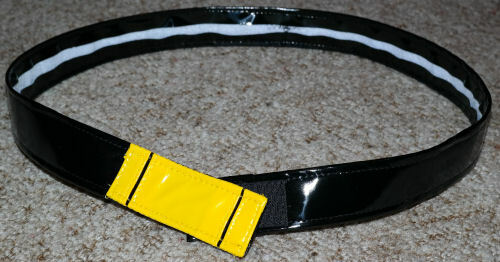 But instead it will be sewn onto the underside of the yellow strip. Font back sleeves. Yellow lines. Collar, yellow lines on sleeves and front facing. 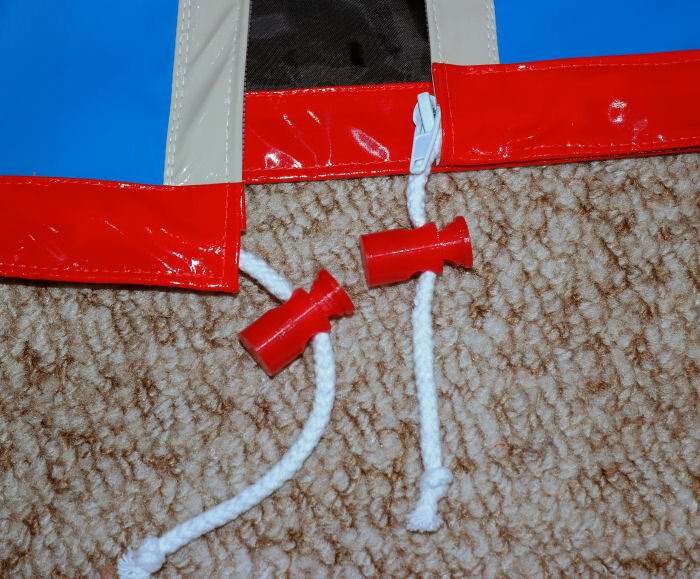 Zip installation. Quiet tricky. I wanted the zip to be covered. Unfortunately this did not work out perfectly and there is a bit of an opening where the teeth are visible. 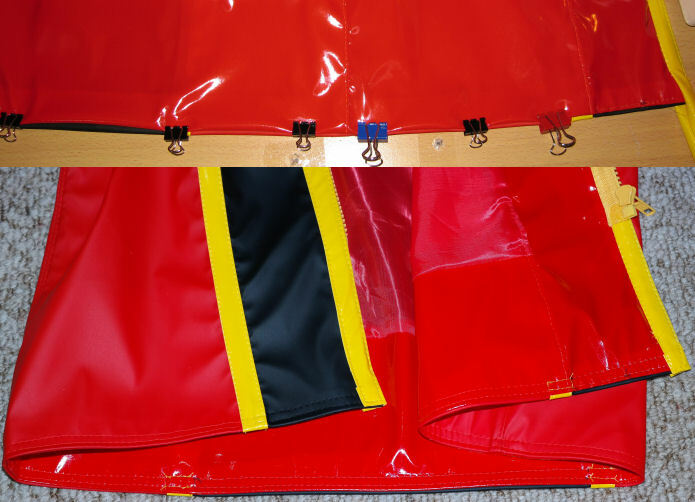 It was a battle between the width of the Teflon foot, extent of needle position adjustment and the maximum distance from the front opening it can be sewn and still be able to have the stitching covered by the yellow strip. Top of the yellow strip can be sewn down now. I think it looks fine, even with the teeth showing! You could have tried and invisible zip, but I'm not sure if they come in open ended versions. 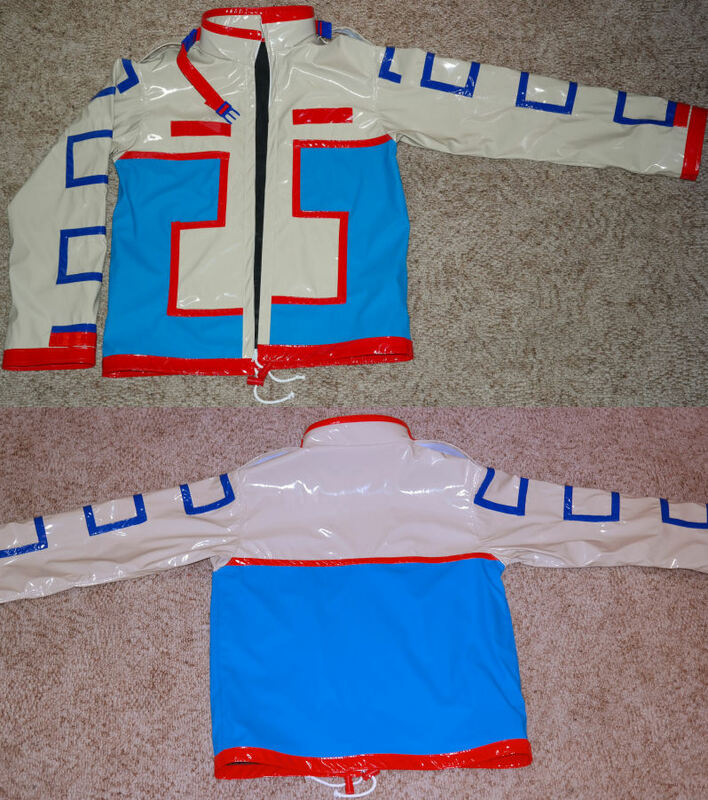 Let's just assume the art is stylised so it doesn't show the jacket fastenings! 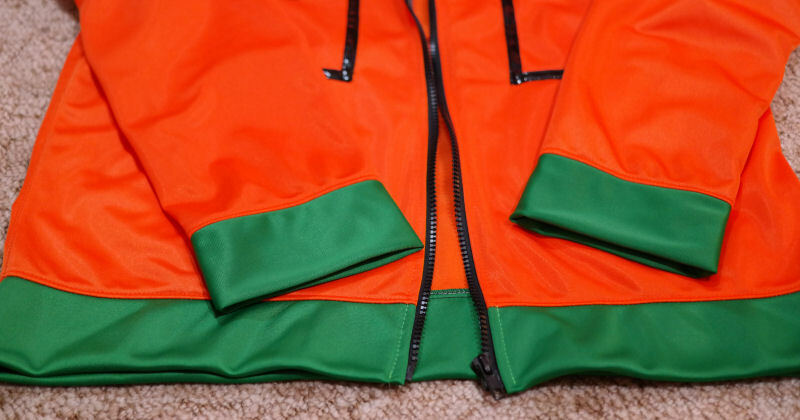 ^ I got the zip when I was in Spotlight around last Christmas time. It was the only long open end one they had and is about the right length. Lucky. 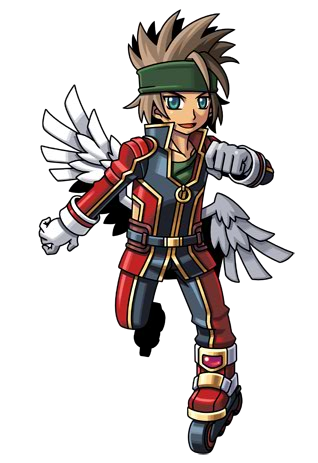 Looking at other views and other characters that have the same jacket, there is a ring on the zip pull. Have not decided how to make that yet. Maybe a keyring. Yellow edging along the zip is finished off and edging along the top is (painfully) attached. 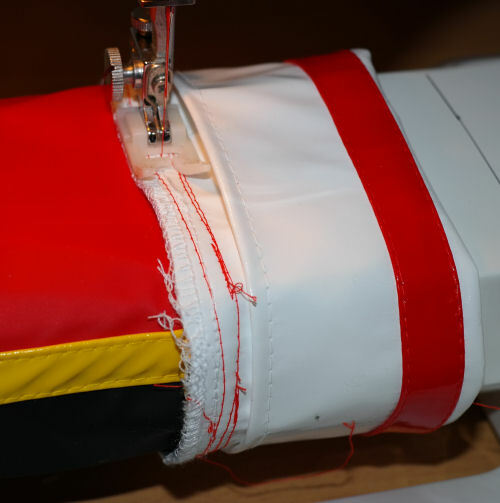 The inner edges of the yellow strip had to be sewn in a way that the stitching lined up with the edge of the fold on both sides. That was not easy, and got a bit messed up in a few places. Lining made and installed. 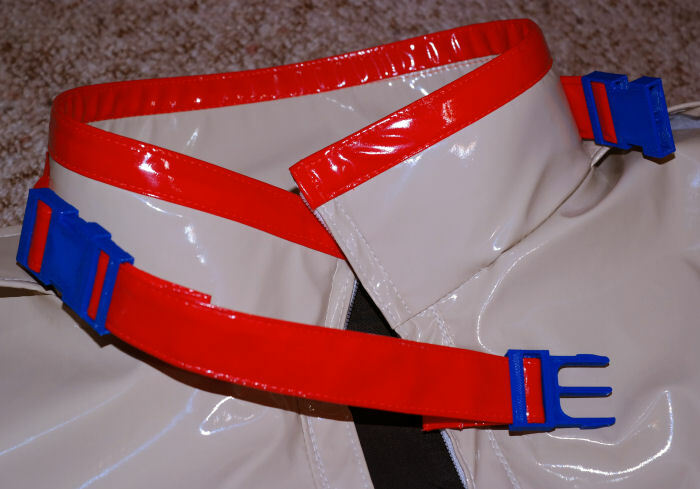 Has facing on the edges to match the inside of the collar. 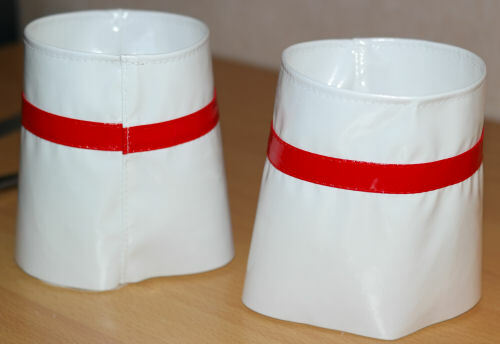 Cuffs are made. When sewing the edge to make them circular I sewed the half that ends up a on the inside a bit narrower so it will sit flat. 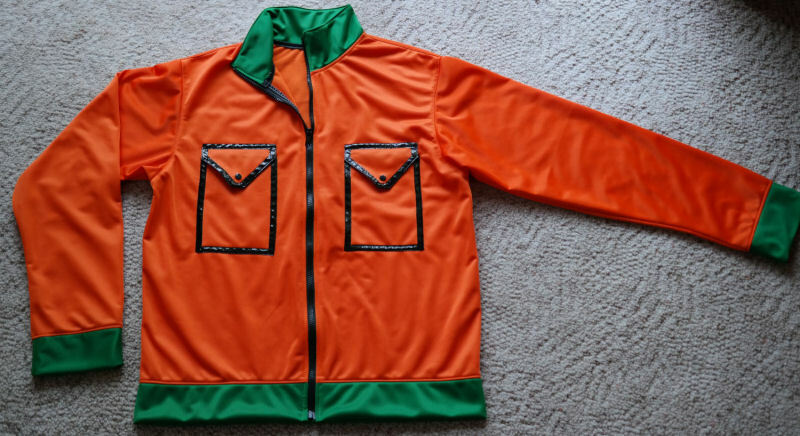 Put inside and stitch around. Attempt to overlock the edges. Did not go well because of the thickness of so many layers. I stitched around again so the overlock mess is hidden. At least the overlocker trims it nicely. 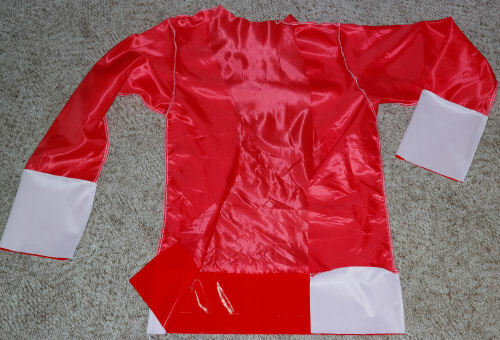 Fold out and stitch the seam down pointing up the sleeve. This will allow the cuff to sit flat with a nice fold. Fold back and it is done. Now only the bottom edge is left. This needs the outside and inside carefully folded up and stitched around. Bottom edge folded in from both sides and stitched down. 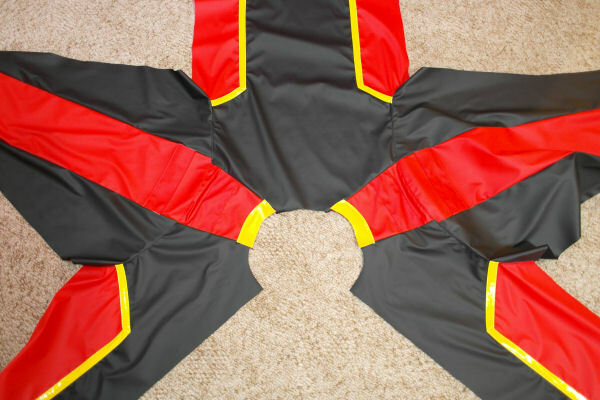 Unfortunately I forgot to use red on the bottom when sewing down along the yellow strips. Apart from that it went well. 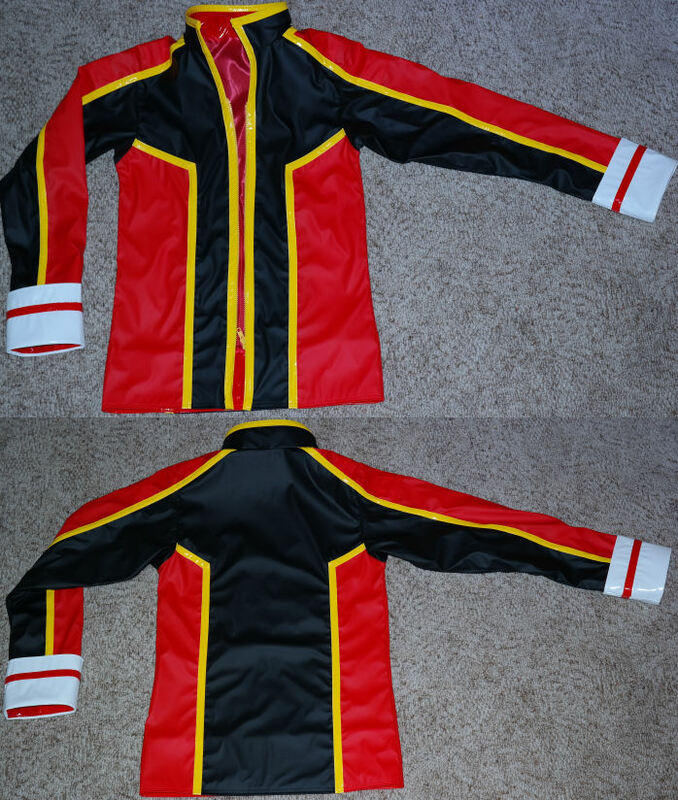 Jacket is finished except for putting a ring on the zip pull. The brown belt thing is done. I tried to make it with curved corners but that did not go very well so I started again with everything straight and it turned out ok. Need to finish off the black belt that goes through it. Shoe covers are done. 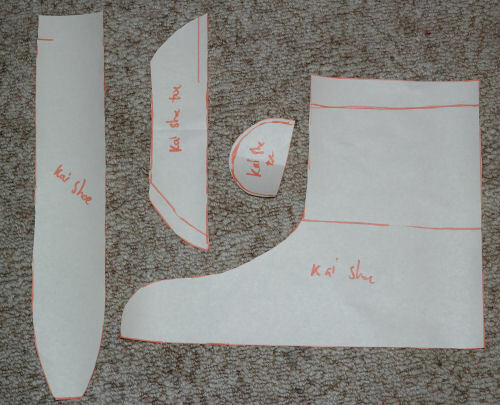 They are similar to what I have made before but I tried out a new pattern where the part that goes up the leg is made from the same pieces as the foot. It seemed to work ok. 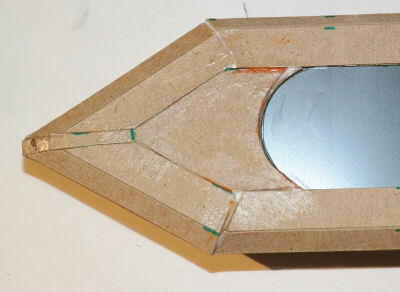 Felt is glued inside to hold the shape. 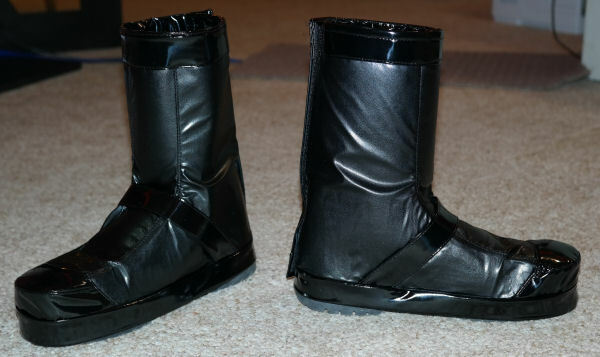 These shoe covers attach to the shoes with Velcro. 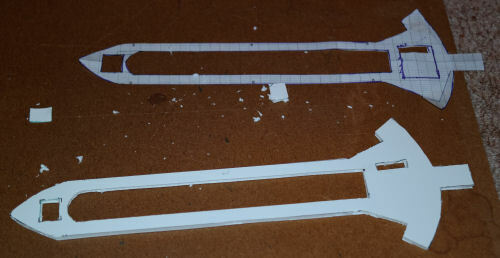 I have started working on parts of the sword. 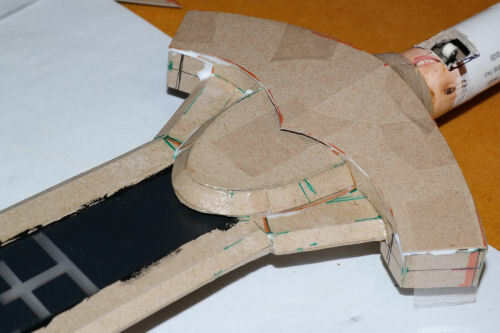 The base of the blade is made from foam core board. 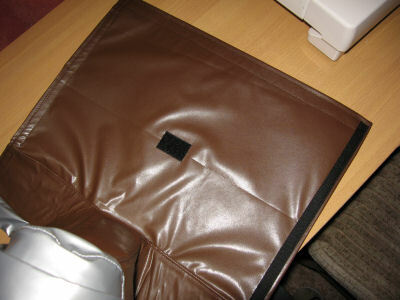 The middle section is cut out so that LEDs and light diffusing plastic sheet can be installed. The lettering will be placed over that. The end of the handle is removable for battery replacement. 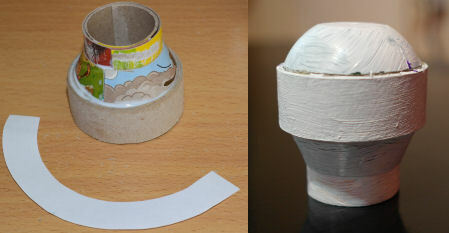 It is made from rolled up and glued cardboard, a curved piece to make the sloping part and the end of a deodorant bottle lid to make the dome part. 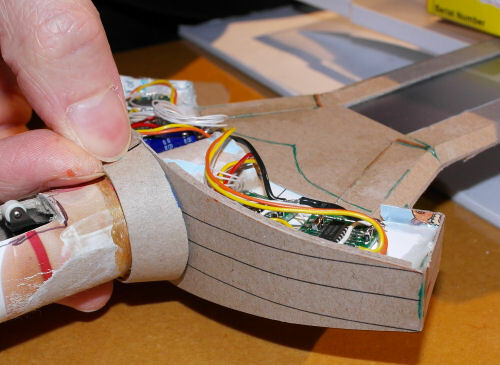 The handle is made from cardboard glued and rolled around a pipe. Once the glue is dry the pipe was removed. Now there is space inside for batteries. There will be a hole in the side of the handle for a power switch. A slot is cut in the end of the handle so the blade can be inserted and held securely. The Square hole at the blade tip is for a gyroscope sensor to allow the LED light to react to movement. 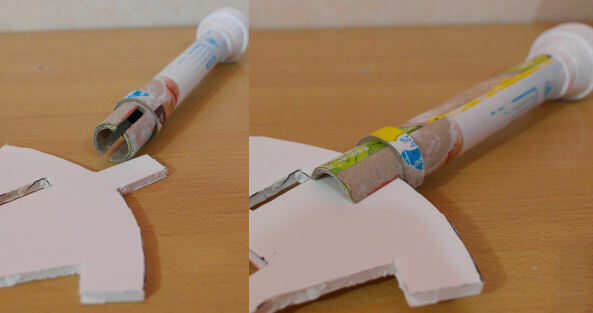 Thin cardboard will be glued down the edges of the blade and around the tip. 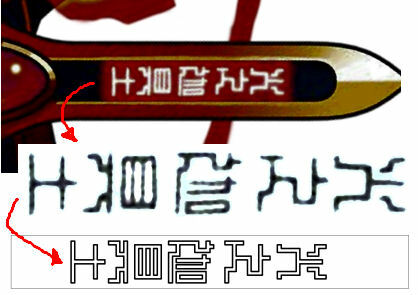 The design for the lettering was made by adjusting the reference picture. Rotating then contrast enhance to make it suitable for tracing around to make a stencil. The stencil was printed to the correct size and used to cut out of thin black plastic. 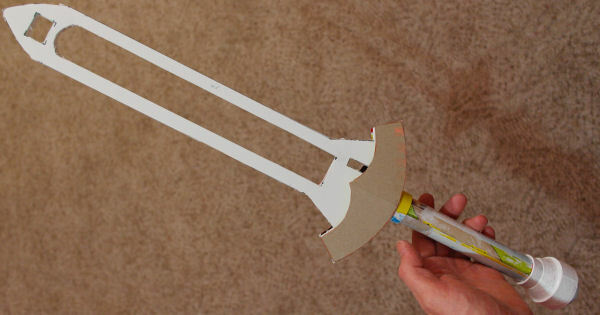 This will be assembled between sheets of transparent light diffusing plastic and installed in the center of the blade. 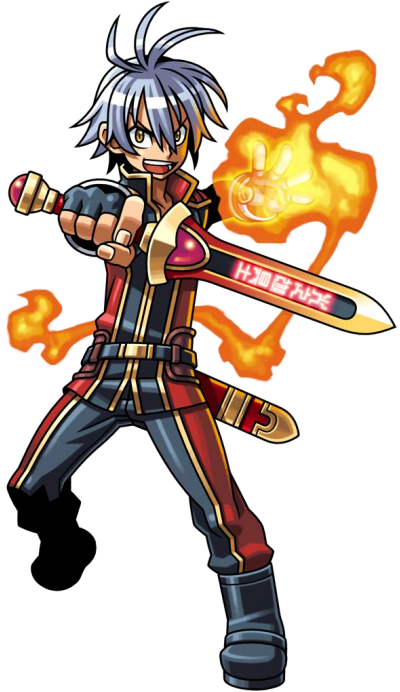 Aww man, your sword is going to be sooooooo coool! The WIP is shaping up to be quite amazing already! I used a battery from a camera. I opened the battery case and removed the cells and monitor circuit. Cells are arranged end on end and the monitor circuit is re connected exactly as it was originally. This is important to avoid over discharging and to monitor charging. Covered with heatshrink. Wires joined into the empty battery housing so that the original charger can be used. This is important for safe charging. I used WS2801 RGB LED Drivers. I and using red LEDs only. Each chip will drive three sets of three LEDs. Five chips are used. They are controlled by SPI from the microcontroller. The chips have constant current sink outputs and have 8bits per output for the LED brightness. 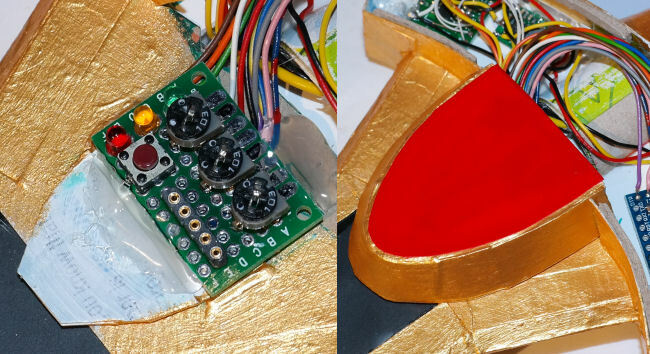 The chips are soldered to adapter PCBs and resistors to set current added along with supply bypassing capacitors. 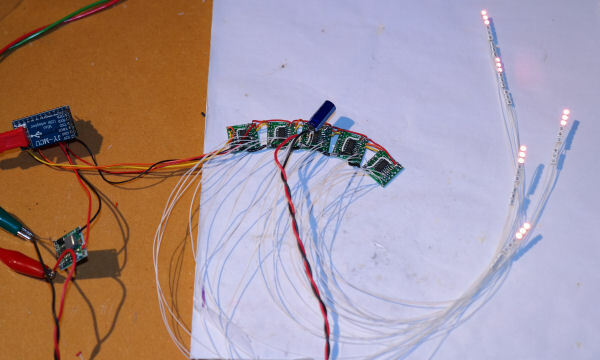 Circuit was built up and tested before installation to make sure it works ok. LEDs are wired up to the controller and a microcontroller is connected to the LED drivers. Software development begins. LEDs glued to the edge of the light diffuser. All the light diffusing parts came from an LCD panel. 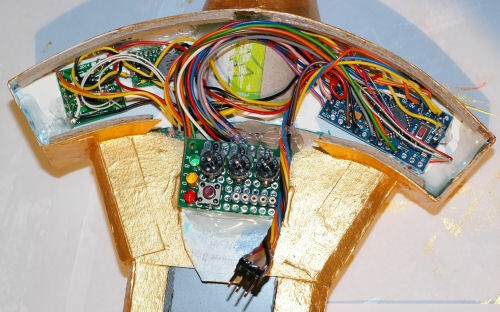 Electronics installation to base of sword. I built a small control panel. It has adjustments for speed and brightness. 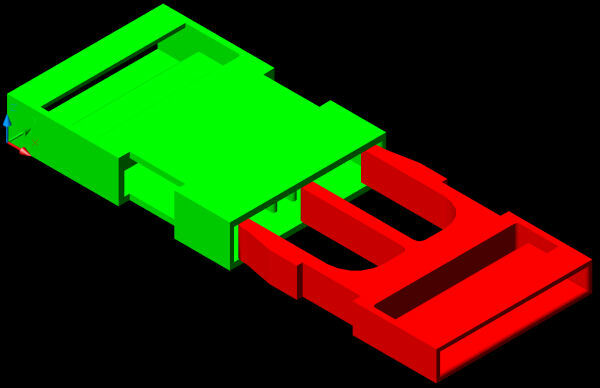 A programming port and LEDs to indicate battery level. There will be a removable cover over it. The battery voltage is measured through an analog input, with a resistor divider to avoid overvoltage on the input. The battery voltage is nominally 8.4V. A buck converter reduces this to 3.3V for the logic. The LEDs are driven directly from the battery. A low voltage cut out is implemented in the software to switch off the display if the battery voltage goes below 7.2V to protect the Battery. The red battery level LED flashes to indicate this state. 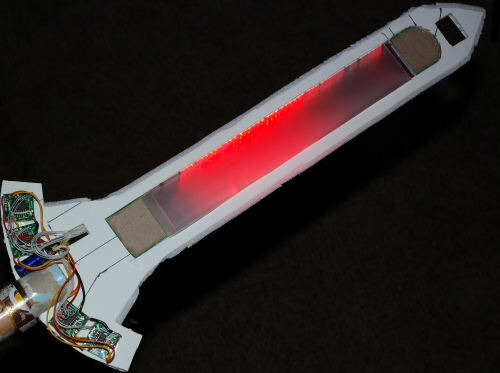 Accelerometer installed and wired up the edge of the blade to the controller. The lettering cut out is layered in the sheets of diffusing plastic. Edging strips are glued in to hold the sheets in place. Blade edging is installed. The other areas of the blade are filled. In with cardboard. The top part of the blade is covered. The other side is left open for now. The neck ended up a bit wider than I was expecting but it is meant to be not visible so it is still a success. 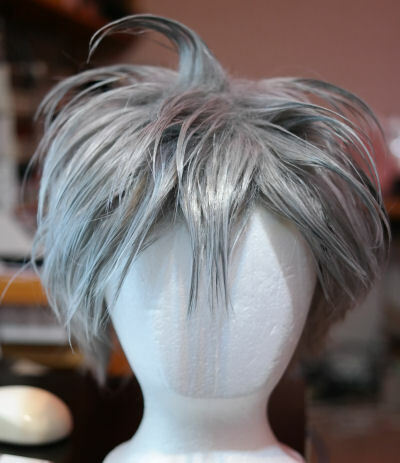 Wig cut and roughly styled. Will need a bit more work. 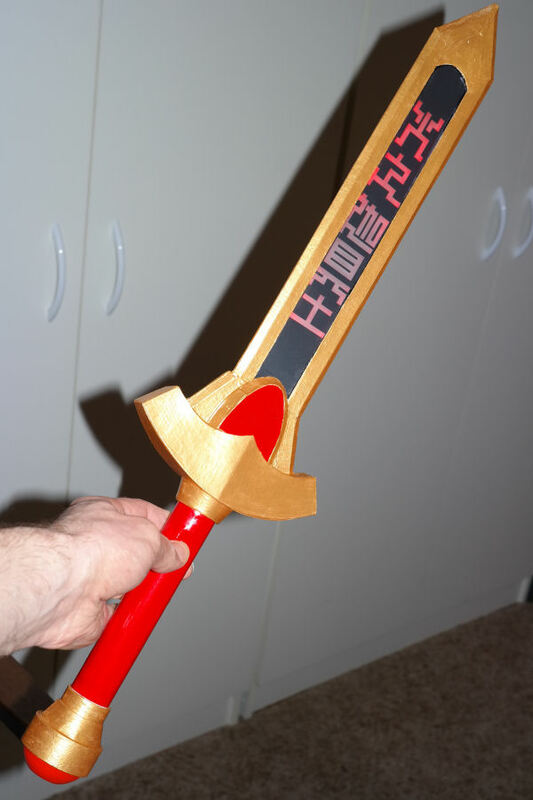 I made the removable cover for the other side of the sword, to go over the controls. Before gluing the cover on the other side I added an ISP programming port in addition to the RS232 type. I was planning to use this to overwrite the boot loader to avoid start up delay, but didn’t in the end because software development did not go as well as I waned. After painting the sword is done. 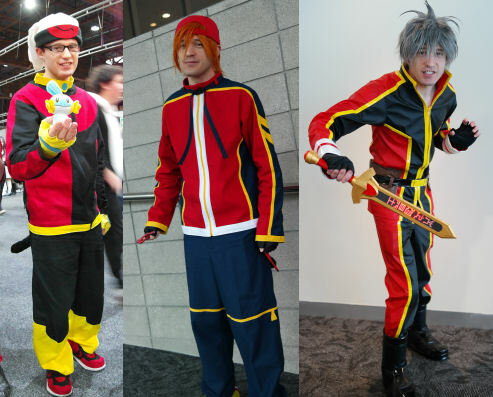 Pokemon Trainer Brendan- Brick from PPGZ - Kai from Shinra Bansho. 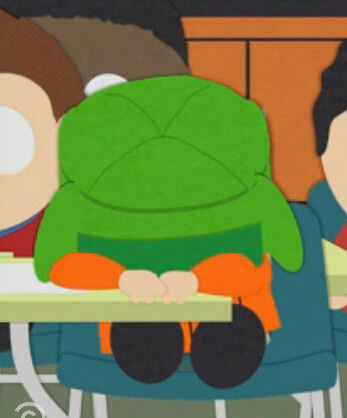 Or I might do something else. 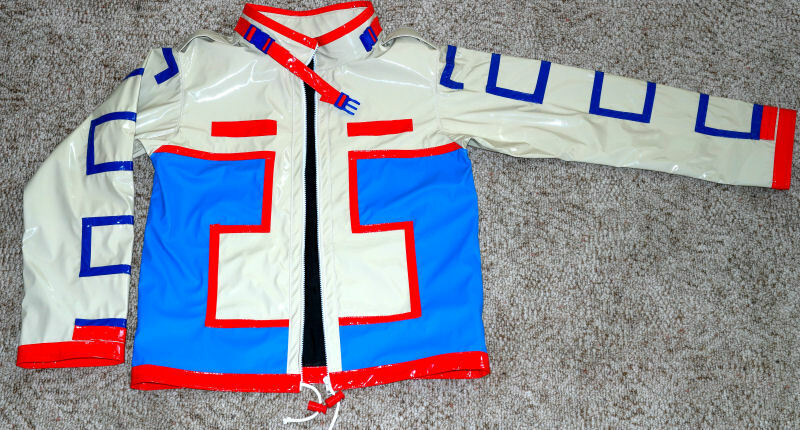 Completed but it seems to have a problem with the zip. It will not zip of correctly most of the time. Not sure what is wrong. It worked before installation. Worked a few times after installation. Now the two sides don’t join. Needs replacing. I drew then 3D printed some of the parts that I could not buy in the shape / colour I wanted. 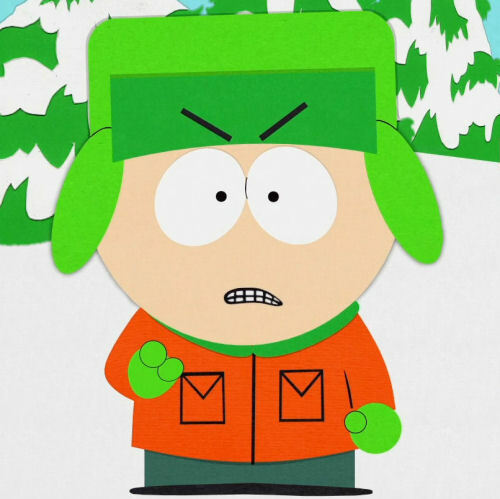 Made Jacket, Gloves, Hat, Scarf. 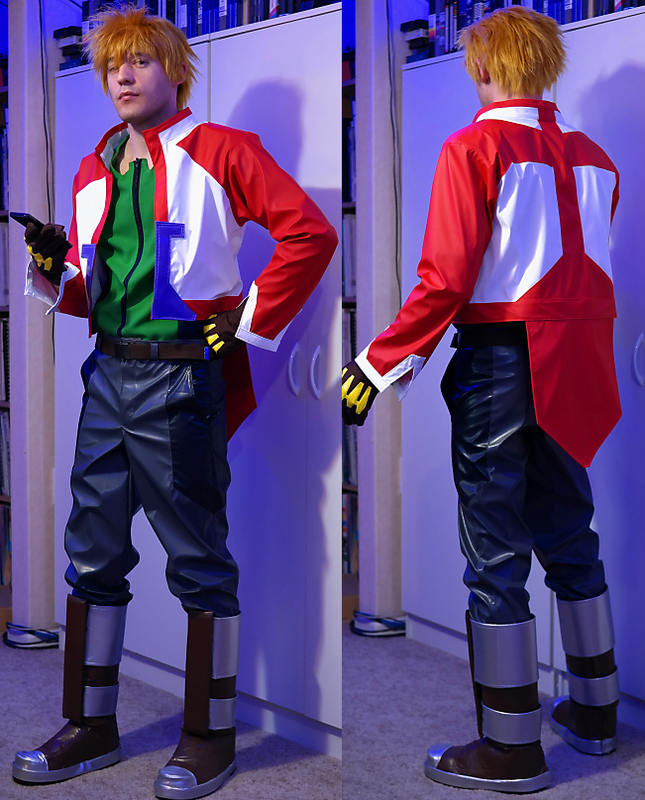 I added additional detail to the sleeves and waist of jacket. Front flap on hat might need stitching to hold it in place. 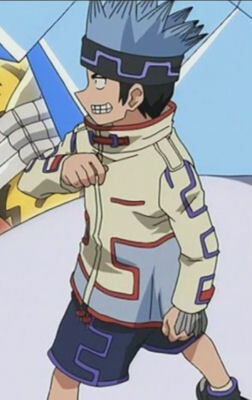 Trousers are Ken from Reborn! Can use normal shoes as there is no shoe detail. 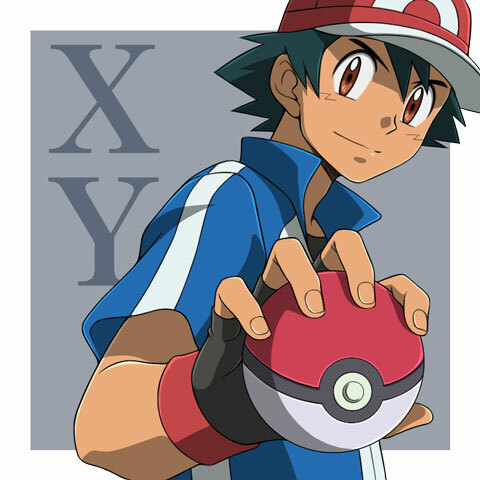 A start has been made on XY Ash, needs a lot more work though. A small amount of progress. 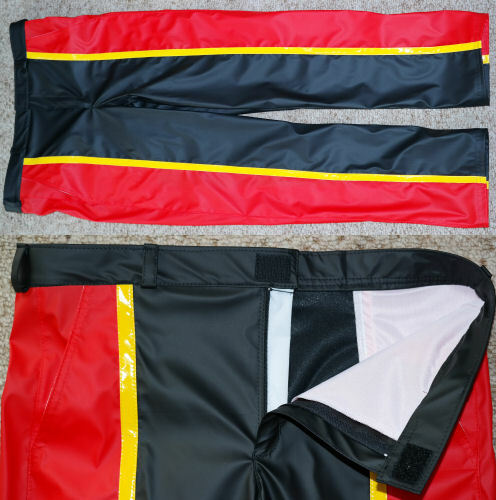 Trousers for new Horohoro are finished. 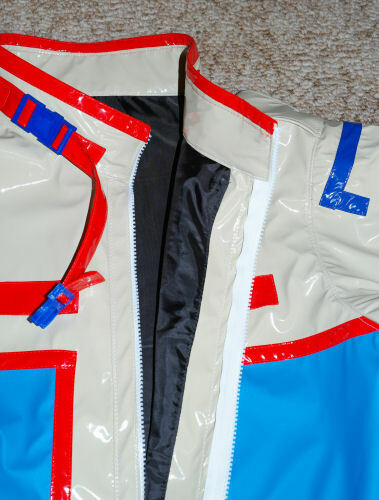 The zip of the jacket did not work reliably, then stopped so it has been replaced. 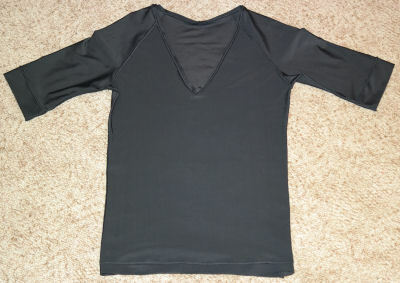 The collar was also too narrow. I replaced the collar and the zip. After very careful measurement the collar still ended up a bit narrower than I wanted which is a bit annoying. It took a lot of work to replace it. I was at Anime Central in Chicago a couple of weeks ago. 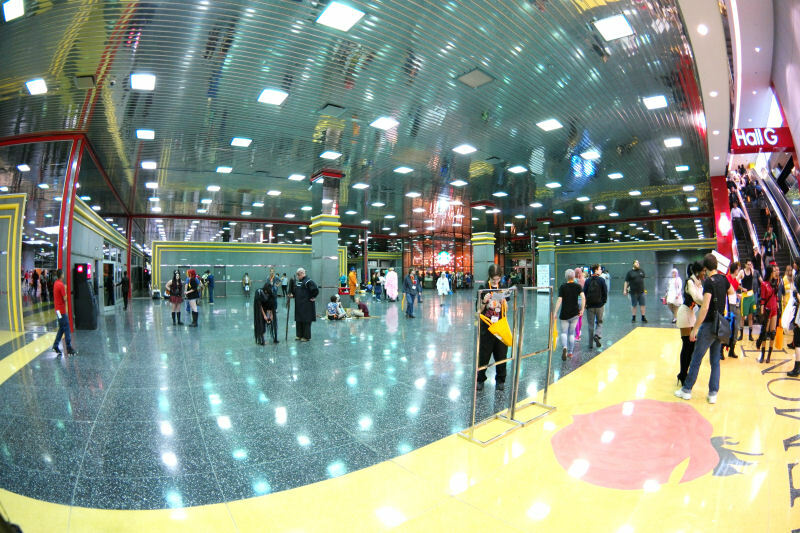 I’d wanted to go here for a few years because the convention center looks interesting in photos. It is quite reflective and that can make it difficult to photograph. 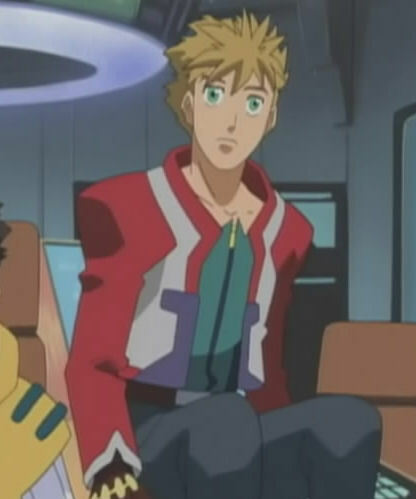 Kai - Shinra Bansho, Brendan – Pokemon, Bit Cloud – Zoids, Kyle – South Park. 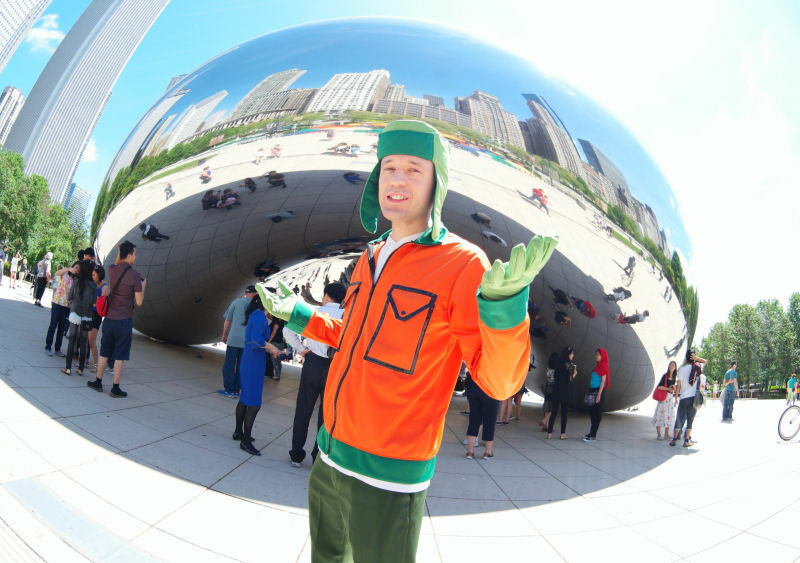 While in Chicago, the other most important thing to do is see Cloud Gate in Millennium Park. It is a very busy place. The weather was very nice that day. 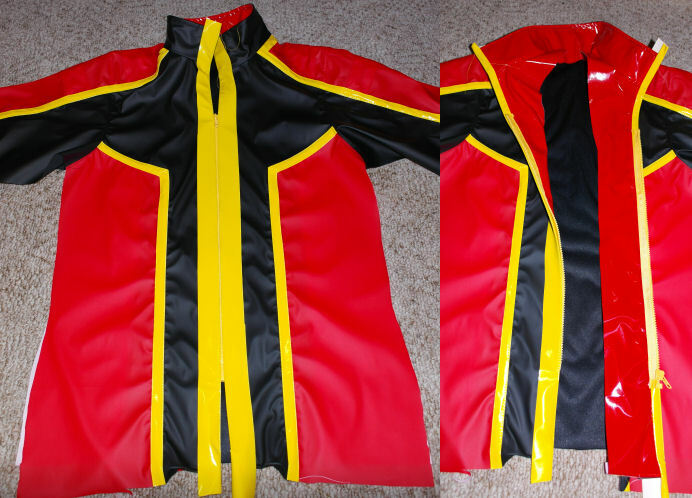 Maybe Soon I will continue work on Pokemon XY Ash Jacket?